Welcome to our 4 star Acorn Cottage, it is all on one level, a converted 18th century barn conversion and furnished and equipped to a very high standard. Probably only cottage with both bedrooms en-suite and a separate bathroom with a bath. Park and ride nearby for easy access to Glasgow, Stirling, Falkirk and Edinburgh areas.Visit the Falkirk Wheel and the Kelpies. All rooms on ground floor. All bedrooms ensuite. Large open plan lounge/dining/kitchen area. Separate utility/laundry room with washing machine and drier, fridge/freezer, double over, ceramic hob, microwave, dishwasher. Colour TV, video, DVD. Both bedrooms have TVs, garden. Rates include heating, electricity, towels and linen. Totally non-smoking throughout. Ideally situated in open countryside on 240 acre farm . WI-FI Internet Access free. Panoramic views. Abundance of wildlife, fannyside RSPB reserve and Palacerigg Country Park nearby. Falkirk Wheel and The Kelpies nearby. Visit Glasgow and Edinburgh's many museums, castles etc. Enjoy day trips to New Lanark World Heritage Museum, Deep Sea World and many other visitor attractions. 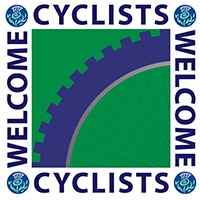 Within 20 miles visit Glasgow, Falkirk, Linlithgow and Stirling. Within 30 miles, visit Edinburgh, Lanark, Biggar. Within 50 miles visit Ayr, Perth, Peebles, North Berwick, St Andrews. Numerous golf courses nearby. Fishing nearby. Regret no pets allowed or large groups beyond the intended capacity of the cottage. Acorn Cottage Welcomes you. 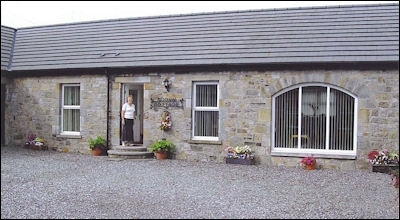 Acorn Cottage Welcomes you. Very large triple bedroom. Large Living area. 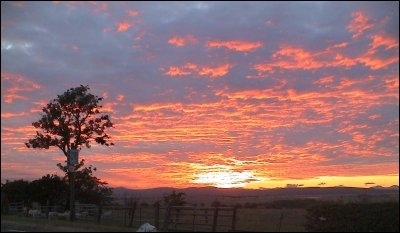 Sunset taken from farm.